Now I can stand behind express buses and go, “you can’t hurt me!” Now I can go to the smoking section of ASTRO and hang out with the cool people. This entry was posted in Music, Pictures on August 11, 2005 by 2konbla. i tried to find one of those &quot;normal&quot; surgical mask. but i couldn’t find one. 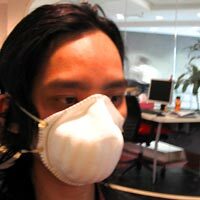 luckily my shop has one of those huge mask that we use when we apply the chemical to the car. i wore that on my way home today. and i feel like i’m Darth Vader!!! hahahahahah!!! i rule!!! lucky you man. i was in midvalley searching in a pharmacy for one of those thingys and they were out of stock! take care dude. the smoke, (it’s smoke, not haze) is bad.